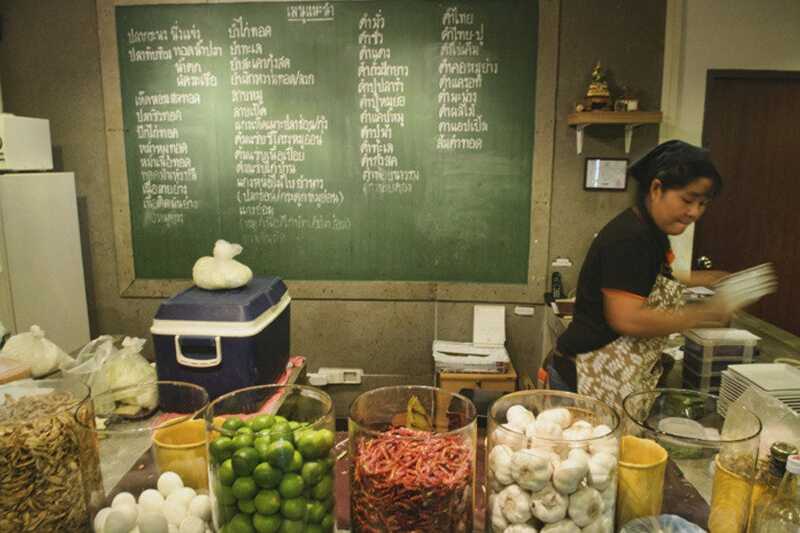 Bangkok has always been a foodie paradise, with knockout meals on just about every block. While the street food here is still second to none, the city has also reinvented itself in recent years with an outstanding array of fine dining options and great gourmet selections from around the world. Gaggan has been voted the Best Restaurant in Asia for four years running now, serving up unique molecular influenced Indian cuisine, and now has two Michelin stars to its name, while just next door, Indian Chef Garima Arora will dazzle your palate with exquisite takes on Asian fare using the freshest locally sourced ingredients at the award-winning Gaa. 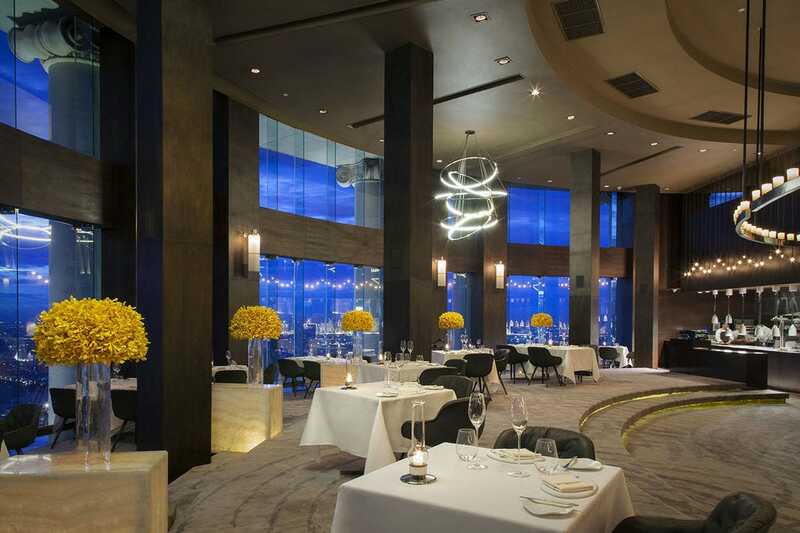 Mezzaluna, set 65 floors up at the Lebua, not only has Bangkok's best view, but it also has 2 Michelin stars and the award-winning cuisine of Japanese chef Ryuki Kawasaki. 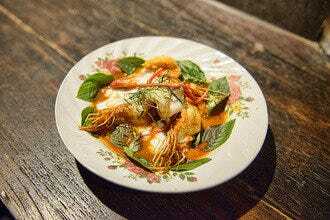 Other truly excellent Thai-influenced spots include the unique creations at Canvas and the outstanding Thai tasting menu at Saawaan. For authentic hard to find Thai dishes at very fair prices, both Supanniga and The Local are the best places in town, and if you want Isaan northeastern spice, head to always crowded Baan Som Tam. 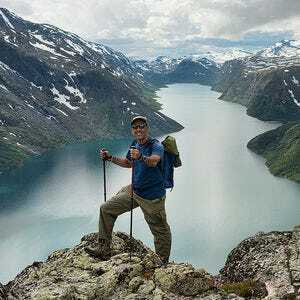 It's not only Thai food that visitors are coming to Bangkok for now though. In addition to Gaggan, Japanese features highly on the Bangkok menu. For creative sushi, Isao will knock your socks off and is probably the only restaurant in Bangkok that has a line out the door 365 days a year. There are thousands of Italian places to choose from, but for a real trattoria, head to Appia. For French, Le Normandie not only serves the best haute cuisine French for miles, but it also has two Michelin stars. You most definitely won't be going hungry in this city. Dinner here is a magical event where you never know what's coming next. Take the "rice bread." Served as a humble appetizer, this is actually one of the menu knockouts and will leave you wishing you had a loaf to take home. Made from organic rice from Surin Province, it's served with brown butter and yellow chili emulsion, and topped with salted egg yolk and toasted sticky rice. Light and ever so flavorful, Sanders says the idea behind it was to serve the Thai staple of rice as a version of the Western staple of bread. 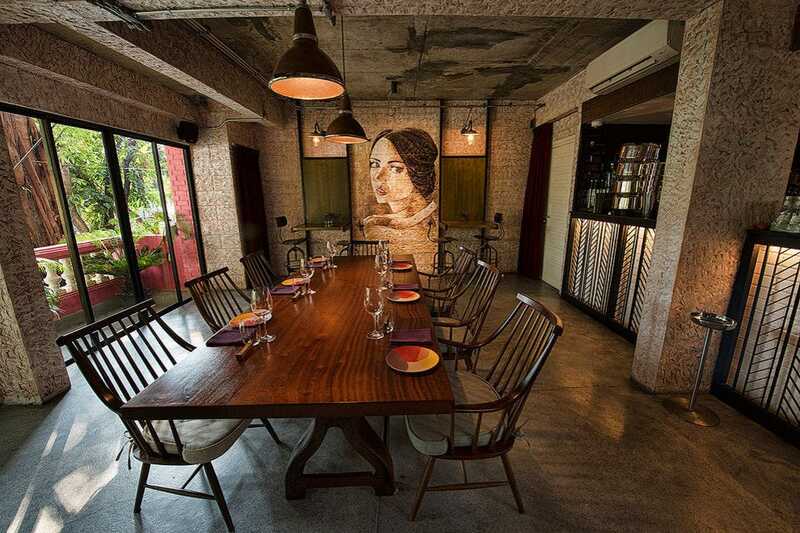 Most appropriately named, Canvas features a chef whose artist's palette is a melange of colors, guaranteed to leave your palate begging for more, and is a most deserving entry into the Bangkok Michelin guide and foodie dining scene that has swept the city. 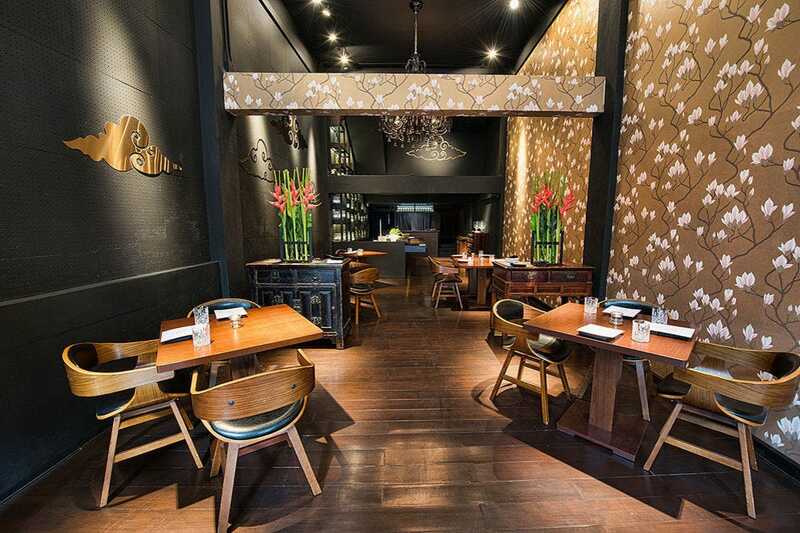 Everything about the dining experience at Mezzaluna is done to utmost perfection. A bevy of staff hovers around your table, never failing to notice whether you need more bread or water, constantly bringing palate refreshers before dishes, and giving detailed explanations of all the captivating creations. An expert sommelier comes out to explain each wine pairing served with the food, not only giving the origins of each bottle, but complimenting its highlights and flavor profiles, and the cellar here is one of the finest in all Bangkok, with several of the wines served being exclusive to Mezzaluna. This is an entire dining experience at its finest, from chef to server to table to the ambiance. 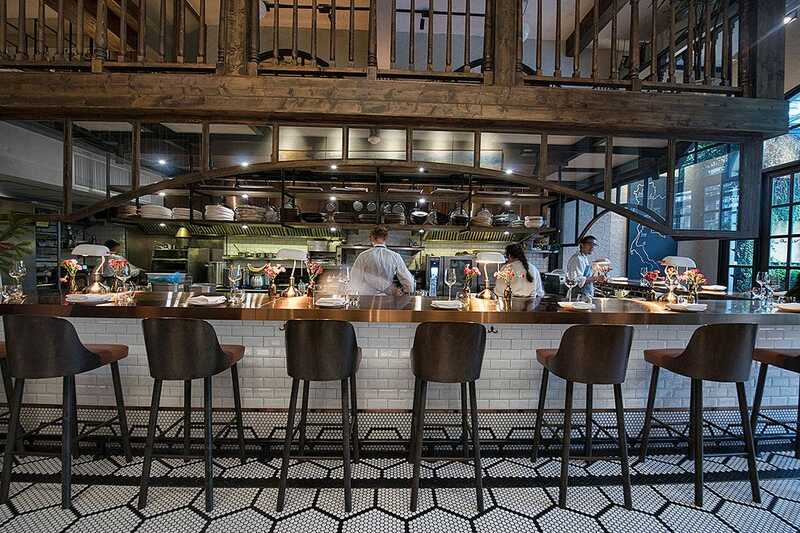 At this point, the sky (and possibly even a coveted third star) is the limit for Mezzaluna and its all-star chef. 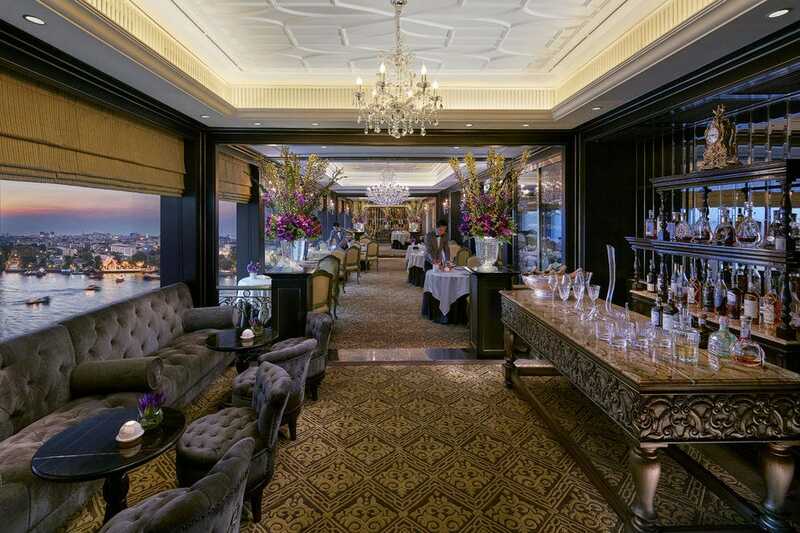 This classy French restaurant on the top floor of The Oriental Hotel is a Bangkok institution. 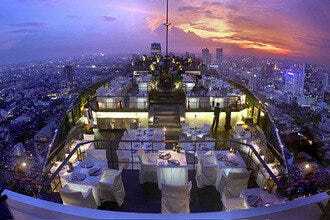 Winner of two Michelin stars, this is one of Bangkok's classiest and premier fine dining spots. Fois Gras and roasted Sisteron rack of lamb are just some of the menu highlights prepared by the visiting French master chefs in residence here, all taken in amidst elegance with views of the Chao Phraya River to boot. 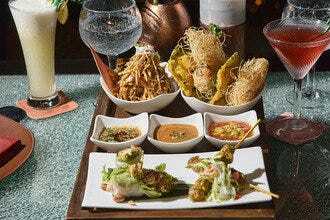 While dinner here is an absolute bank breaker, the set lunch provides a way for paupers to dine like princes and indulge in Bangkok's most sophisticated restaurant. An appetizer, entree, and dessert set menu goes for the steal of 1500 baht and introduces you to some world-class cuisine. Isaan, or northeastern cuisine, is probably the most common food eaten in Thailand, by both visitors and locals alike. 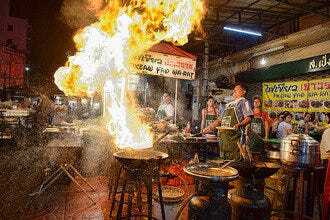 Some of the best Isaan food is found at corner street stalls, which most tourists find too hot and uncomfortable to sit at, whereas the food in fancier digs often leaves a lot to be desired. Baan Som Tam creates a very happy medium with fantastic fresh northeastern cuisine in a homey air-conditioned environment. The sai krok spiced sausages made with sticky rice are superb here, as is the namesake papaya salad (som tam), with all of the ingredients tasting so fresh and flavor-packed you will think they are organic. 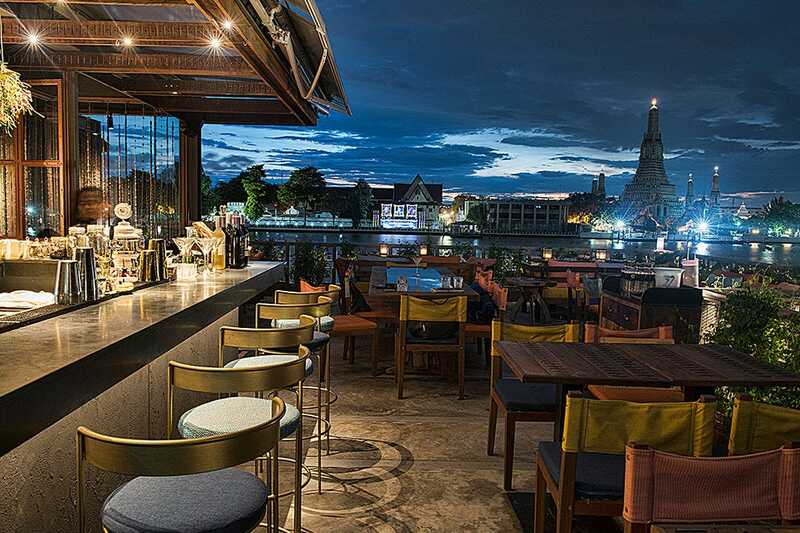 Packed with happy diners every night, Baan Som Tam was recently given a Bib Gourmand listing by the Michelin Bangkok guide for its combination of excellent food and fair prices. While this small eatery just off of Sukhumvit is always packed with discerning diners coming to try out creations that just aren't available elsewhere in Bangkok, so much that it is next to impossible to get a seat, lunch offers better prospects, and Isao is well worth a visit. The owner at Isao studied under the chef at Green Tea in Chicago and obviously brought back some creative expertise. Try out some of the signature fusion specialties here such as the Volcano, a baked scallop in a cream sauce served in its shell resembling orange molten lava, spicy and taste tingling. Or how about the Jackie, a caterpillar-shaped sushi roll with egg, boiled shrimp, roe, and tempura, or the Chicago Spicy Crazy, which features salmon, tuna, white fish and vegetables. 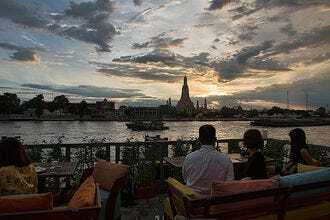 The the latest branch is set right opposite Wat Arun, incredibly romantic come sunset and evening, and really is the perfect riverside date spot. The menu is downright authentic, with popular favorites like moo chamuang, a succulent long-stewed pork curry, flavored with garcinia leaves, or poo ja, ground crabmeat and pork that has been seasoned with pungent Chantaburi pepper and steamed inside a crab shell, heading a list of unique and flavor-filled bites. 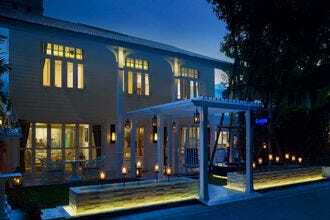 What sets this Supanniga apart from others besides the view is it's teaming up with noted local cafe gurus Roots Coffee and creating an extensive Thai desserts menu to go with the coffee. You can eat the popular street food-favorite coconut rice cakes or deep blue butterfly pea custard served with steamed bread, and accompany the sweets with a cappuccino, or perhaps something more adventuresome such as the Hanuman Cold Brew, where cold brew gets infused with dehydrated jackfruit and an oolong and chrysanthemum tea blend, a Roots creation that is totally unique and found only at this location. Owner Kan Markawat and his sister Ploy come from a family of traditional foodies, and they have put their love of traditional and hard to find dishes from all over Thailand on display at the lovely new eatery, The Local, where one can dine in a 70-year-old traditional teak home, outfitted with antiques, wooden bird cages, old paddles from the floating market, and bookcases full of Thai cookbooks from throughout the ages. The menu is large and varied and standouts include gaeng lun juan, which comes from the Rama V Royal Court and is made with beef or pork laced with aromatic Thai herbs and shrimp paste, highly aromatic and bursting with flavor. Another menu winner is the gaeng kua pla bai som pan kee maa, a spicy yellow curry fish with hard to find orange leaves from the south, and don't forget to save room for the homemade ice cream and perhaps one of the signature cocktails such as the Safflower, made with Mekong whiskey, safflower, and kumquat juice, and a perfect complement to the food. 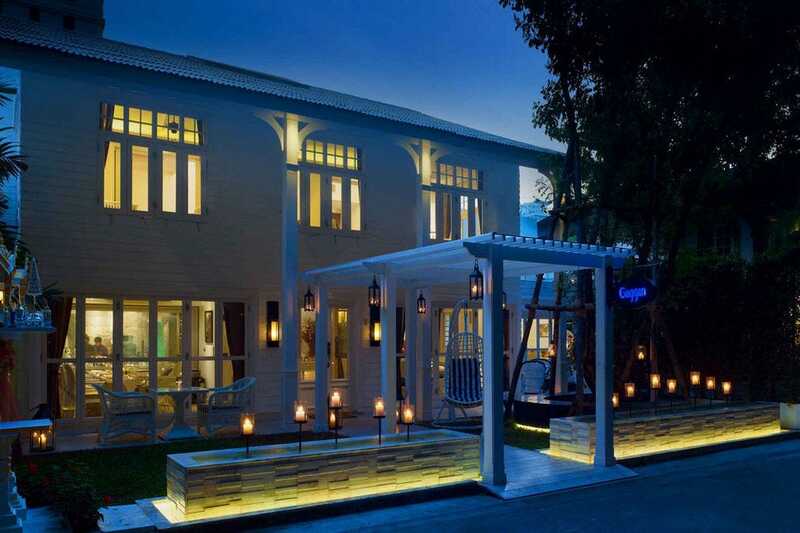 The restaurant was named as a Bib Gourmand choice by the new Michelin Bangkok guide. Set in a leafy side street in a beautifully refurbished house, where comfortable rooms have soft lighting, dark wood, and large windows, diners have their choice of tables. Several rooms are suitable for private groups, while the main dining area looks out into the trees and foliage. One room features a table set under a painting of the home's former owner, who appears to look out in watchful gaze at the fabulous feast appearing in front of her. While many Michelin restaurants serve up fine Wagyu beef or try to bowl you over with foie gras presentations for their main courses, Gaa again bucks the trend, instead opting for unripe jackfruit, served here with jackfruit roti and a variety of pickles. As opposed to the sweet fruit, the unripe version is thick and meaty and will make a believer of any carnivore. And for those who can't live without their flesh, the caramelized sous vide pork belly served with a tamarind glaze, shallots, coriander, and pomegranate, is not just the best piece of pork you'll have in Bangkok, but possibly in all Asia if not elsewhere. For the finale here, several desserts seal the deal. One is a deconstructed banana bread, a bite-sized morsel that will have you thinking you are in a fine patisserie, and then another great take on Indian habits, that of chewing a stuffed betel nut leaf (known as "paan") after eating, although here at Gaa the leaf is half covered in 85% dark chocolate, with the other side having crumbled cardamom dust. 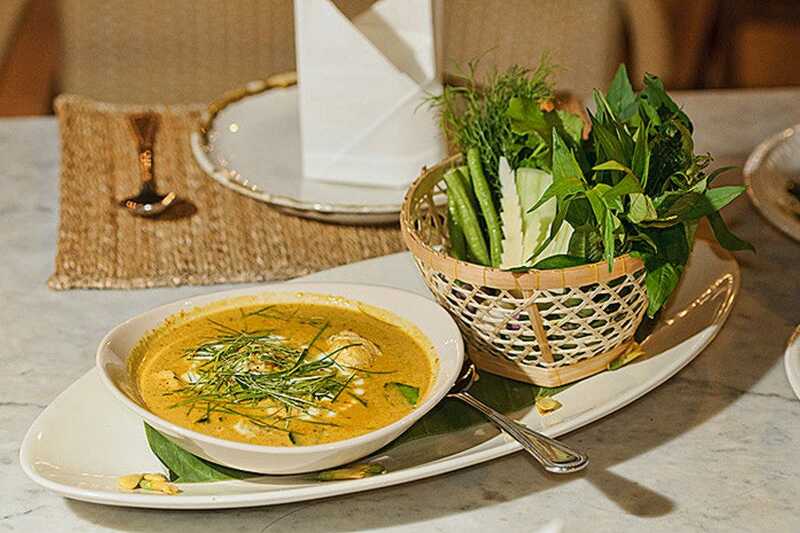 Saawaan's 10-course tasting menu is divided into dishes that represent all of the concepts and techniques found across the board in Thai cooking. You'll get to sample raw, fermented, dip, boiled, grilled, stir-fried, curry, and sweet here, and the fun starts before you even get to the menu. 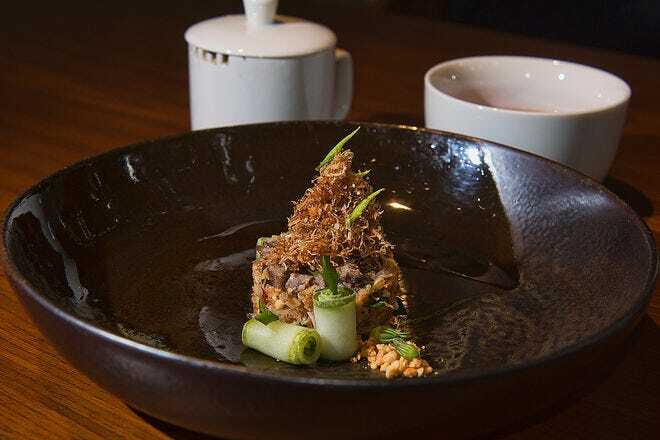 The complimentary starter, an amuse bouche of "kai luk koei," sous vide egg served with cream, tamarind sauce and chili oil, that comes served as if in a bird's nest. It's small and delicate, but packs such a wildly wonderful array of flavors, and sets the tone for what lies ahead. Another total standout is the "gai kati khao luem pua," a chicken curry in which free-range chickens from Nakhon Pathom are flavored with a Central Thai curry sauce and served with pineapple and bamboo shoot, alongside of what is known as "forget the husband" rice, so called because it is so good that the housewife serving it would forget her husband was also at the dinner table while she was eating it! From presentation to the creamy curry and perfect spice balances, this is the final course prior to dessert, and pretty much sums up the entire experience here, one of total dining bliss. You'll also want to leave room for dessert, as Bangkok's most noted pastry chef, Arisara "Paper" Chongphanitkul, a graduate of the French Gastronomicom culinary school, lends her expertise to the sweets here, serving up pumpkin and coconut custards alongside durian-flavored chocolate petit fours to close out the evening.